Richard Gere has been operating a much quieter career resurgence lately, taking on heavy roles in dramas like Arbitrage and Time Out of Mind, as well as appearing in more crowd-pleasing fare like The Second Best Exotic Marigold Hotel and Hachi: A Dog’s Tale. But the former heartthrob is still waiting for that truly career-defining role, the kind that would win Matthew McConaughey an Oscar – an award that Gere has never yet been nominated for – which is probably a good thing, because his performance as the titular character in Norman: The Moderate Rise and Tragic Fall of a New York Fixer (yes, that is the full title, and you’re damn right I’m going to use the whole thing in this review!) is more caricature than it is a fully endearing character – but that’s entirely the point. Gere plays Norman Oppenheimer, a Jewish New York self-proclaimed “consultant” for powerful political figures, but in reality is more of a nuisance as he constantly bombards people either by phone or in person until they become part of his personal network. One such target, Israeli politician Micha Eshel (Lior Ashkenazi), is won over by Norman’s tactics after he buys Micha a very expensive pair of shoes, and Norman is ecstatic about having this high-profile figure in his web, especially when three years later, Micha becomes the Prime Minister of Israel. 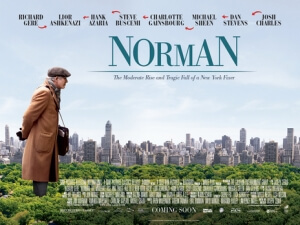 This represents the “moderate rise” of the title, as Norman begins to have much more of a following in his Jewish community after they learn of his top-tier connection… but of course, the “tragic fall” aspect of the title must also come into play, particularly when political stress and allegations of corruption come to light. It’s important to note that the character of Norman Oppenheimer, and subsequently Gere’s performance as said character, is represented as a common Court Jew archetype, from his dialect to his neurotic behaviour over things like his peanut allergy. It’s as though Gere is doing a Woody Allen impression in a film that doesn’t feel that far off from the style and structure of a Woody Allen film – it is in fact written and directed by Joseph Cedar, an Israeli filmmaker who makes his English-language debut here after directing the Oscar-nominated Beaufort and Footnote – and, much like one of those Allen surrogates you often get in one of his films, your tolerance and patience with him varies from audience member to audience member. However, what’s also fascinating is that the character is based on real-life figure Joseph Süß Oppenheimer, an 18th century German Jewish banker who was tried and later executed for similar practises that the character in this film indulges in, and whose life story inspired a number of films in the early 20th century, most notably Nazi propaganda film Jud Süß which to this day is regarded as one of the most anti-Semitic films ever made, with its vastly negative portrayal of Jewish stereotypes being a new low even for the Nazi party. How this all relates back to Norman: The Moderate Rise and Tragic Fall of a New York Fixer is in how it takes the common Jewish stereotypes that the real-life past, especially Jud Süß, have popularised and turns them on their head; sure, Norman Oppenheimer displays archetypal behavioural patterns, but writer-director Cedar manages to humanise him to a point where you almost feel a great deal of empathy for him, even when he’s doing some rather dodgy things. We don’t know that much about him, other than stories he tells of his daughter and late wife which may or may not be true, but we immediately get a sense of loneliness about him as he’s constantly trying to get through on the phone to all these clients of his, probably just out of personal desperation instead of actual professional contact. However, his archetypal attitude is easily exploited by a number of people, including Steve Buscemi’s rabbi who is seeking funding to keep his synagogue open and Micha’s frustrated political team, which contributes heavily to his eventual “tragic fall” which is absolutely tragic in the sense that here’s a guy who means well but has to do some unorthodox things just to get his foot in the door, and he’s taken advantage of so severely that by the end of it he’s more than just a broken man. Cedar writes this character as a deliberate weapon against the popularised Jewish stereotype brought about by the likes of Jud Süß and both mocks it and plays it against expectations, and despite Gere’s Allen-esque performance he still manages to be quietly understated in the role, fully embodying his character’s nature and much deeper complications. I’m not going to pretend like this movie is for everyone, as all the political and business jargon can be hard to follow at times, and there are parts where the film tends to drag itself towards a run time of just under two hours, but Norman: The Moderate Rise and Tragic Fall of a New York Fixer is still an interesting movie to talk about, and whether or not you walk away from it fairly satisfied by the product as a whole you can still find plenty of conversational jumping-off points within it, from the defiant portrayal of Jewish stereotypes to the intriguing political climate surrounding this one character. Either way, you’re going to get something that’s appetizing enough with a peculiar after-taste. Norman: The Moderate Rise and Tragic Fall of a New York Fixer makes an interesting case both for and against commonly associated Jewish stereotypes, with writer-director Joseph Cedar and lead actor Richard Gere creating a character which at first glance seems like an overbearing Woody Allen clone, but once you learn of its more complex historical ties then it becomes a defiant and surprising examination of a character whose archetypal attributes and complicated human flaws lead to both the “moderate rise” and “tragic fall” of the title.